Pictured: 2018 Bid For Good $100,000 grant recipient Cana Communities. Sydney Airport and Sydney Community Foundation, have opened applications for 2019 Bid for Good grants. This year will see the award of another $100,000 grant, in addition to a number of smaller grants. Sydney Community Foundation and Sydney Airport are calling for applications from charities for this year's grants, with 2019 campaign attracting many wonderful projects run by local changemakers situated in the suburbs surrounding Sydney Airport. This unique campaign sees funds raised from the annual Sydney Airport Lost Property Auction of unclaimed items left at the terminal. The Auction is run online by Pickles from 19 August 2019. Sydney Community Foundation, established in 2004, has over a decade’s experience connecting philanthropy with Sydney communities in most need. As small grant specialists, SCF has overseen the distribution of almost $5 million to innovative, local grassroots charities who design and run projects that support people at greatest risk in the Greater Sydney area. The 2018 Sydney Airport Lost Property Auction raised $170,000. The major grant recipient was Cana Communities, receiving $100,000 to support those suffering from homelessness and drug addiction across Greater Sydney. 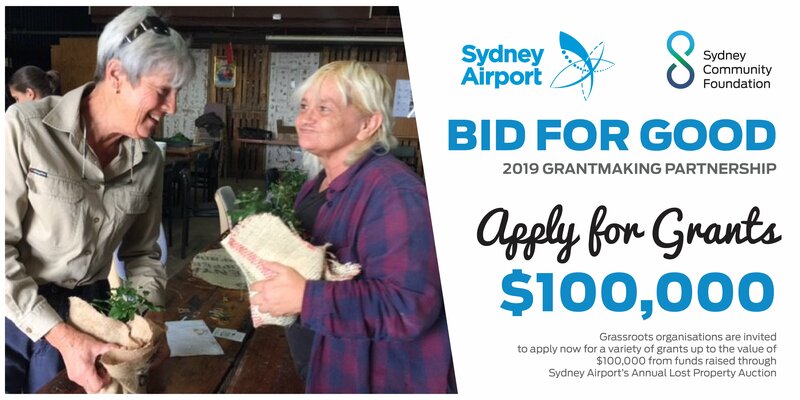 Together, Sydney Airport and Sydney Community Foundation invite those (DGR1) organisations who are doing great work to improve the lives of people in need across Sydney to express interest in receiving a grant from the Bid for Good 2019 Lost Property Auction Partnership. If available, please include a video link about your organisation/project, its aims and how you will use the funds if successful. Phone footage is acceptable. Report on project achievements and how these were reached, including specific outcomes, i.e. the number of people helped, where they live, their age, and gender etc. Yes. To give each application due consideration and help us streamline the process, if you don't have one already, please create a Google account for your application. Can I go back to my Application once I've started filling it out? Unfortunately no. Please download the application form as a word document here and then cut and paste your answers into the Google form when you are ready to apply. What is DGR1 status and do I need it to apply? Yes. We are only able to grant to Deductible Gift Recipient (DGR) registered charities, and specifically those of DGR1 status. If you're not sure, please check with your organisation's finance team. My organisation is located outside the priority LGA's, but the program will be delivered within can I apply? Yes, as long as your program is supporting people in need within the priority LGAs listed in the selection criteria your application will be considered. My organisation is located outside the priority LGA's, can I apply? Priority will be given to programs delivered within the LGA's listed in the selection criteria. Which organisations are not eligible for funding? Sydney Airport Lost Property Auction will take place from 19 August with a viewing day for bidders on 19 August 2019.